Peppa and her family need something to eat for lunch. It's time for a trip to the supermarket! 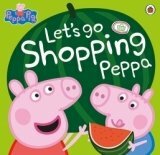 Mummy Pig is very keen on just getting the things on her shopping list, but when they get to the checkout, something else has appeared in the trolley... This picture book story is perfect for reading at bedtime, playtime and over and over again! Based on the hit pre-school animation, Peppa Pig, shown daily on Five's Milkshake and Nick Jnr.